My FOI request (below) is related to the Swindon ‘WiFi’ scheme, which is a ‘public/private’ partnership between Swindon Borough Council & Digital City (UK) Ltd*. (*Digital City (UK) Ltd was formerly known s ‘DM56 Limited’ until its name was changed to Digital City (UK) Ltd.
Members of the www.talkswindon.org forum have asked Swindon Borough Council to explain why its Director of Business Transformation, (Mr Hitesh Kumar Patel), became a Director of Digital City (UK) Ltd just before the Council lent the company £450,000 of public money, but publicly denied he was a director of the company. Readers may be interested in this Talkswindon forum discussion topic which carries ‘before’ and ‘after’ screenshots of Mr Patel’s LinkedIn profile. Mr Patels ‘hidden’ Directorship of Digital City was publicly questioned by a member of Swindon Borough Council ‘Cabinet’, (Councillor Peter Greenhalgh) on the 10th March 2010. 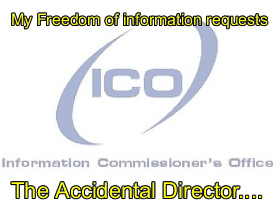 Mr Patels directorship of Digital City was implicitly denied at this meeting although Companies House records show that a TM01 ‘Termination of Directorship’ form was submitted to Companies House on the 12th of March 2010, thus bringing Patel’s directorship to an end. To date, Cabinet members at Swindon Borough Council have repeatedly failed to answer many basic and reasonable questions about the Swindon WiFi scheme apparently preferring to simply ignore the question and the questioner. ‘Political embarrasment’is one possible reason for their behaviour, which unfortunately leaves those interested in the ‘business’ dealings of our elected representatives and council little choice but to submit Freedom of Information requests to get answers to simple and reasonable questions. We would obviously prefer Swindon Borough Councils default position to be one of transparent and open engagement with the electorate. Unfortunately this is not their position and, although a televised House of Commons ‘Adjournment Debate’ on the Swindon WiFi scheme highlighted many concerns about this scheme and its architects, getting accurate and believable information about this scheme is usually like pulling stubborn teeth. been recorded at Companies House? Limited/Digital City (UK) Ltd by signing form 288a ? Digital City (UK) Ltd ?